The Hitler Youth (German: Hitlerjugend (help·info), often abbreviated as HJ in German) was the youth organization of the Nazi Party in Germany. Its origins dated back to 1922 in form of predecessor organizations affiliated to the (at the time) Munich-based Nazi Party. From 1933 until 1945, it was the sole official youth organization in Germany and was partially a paramilitary organization; it was constituted of the Hitlerjugend proper for male youth aged 14 to 18, the Deutsches Jungvolk (German Youth) for younger boys, and the League of German Girls. With the surrender of Nazi Germany in 1945, the organization de facto ceased to exist. On 10 October 1945, it was outlawed by the Allied Control Council along with other Nazi Party organizations. Under Section 86 of the German Criminal Code, the Hitler Youth is an “unconstitutional organisation” and the distribution or public use of its symbols, except for educational or research purposes, are not permitted. In 1922 the Munich-based Nazi Party established its official youth organization called Jugendbund der NSDAP. It was announced on 8 March 1922 in the Völkischer Beobachter, and its inaugural meeting took place on 13 May the same year. Another youth group was established in 1922 as the Jungsturm Adolf Hitler (help·info). Based in Munich, Bavaria, it served to train and recruit future members of the Sturmabteilung (or “Storm Regiment”), the adult paramilitary wing of the Nazi Party. After a short power-struggle with a rival organization—Gerhard Roßbach‘s Schilljugend—Gruber prevailed and his “Greater German Youth Movement” became the Nazi Party’s official youth organization. In July 1926 it was renamed Hitler-Jugend, Bund deutscher Arbeiterjugend (“Hitler Youth, League of German Worker Youth”) and, for the first time, officially became an integral part of the Sturmabteilung. The name Hitler-Jugend was taken up on the suggestion of Hans Severus Ziegler. In April 1932 Chancellor Heinrich Brüning banned the Hitler Youth movement in an attempt to stop widespread political violence. But in June Brüning’s successor as Chancellor, Franz von Papen, lifted the ban as a way of appeasing Hitler, the rapidly ascending political star. A further significant expansion drive started in 1933, when Baldur von Schirach became the first Reichsjugendführer (Reich Youth Leader), pouring much time and large amounts of money into the project. The members of the Hitler Youth were viewed as future “Aryan supermen” and were indoctrinated into racism. One aim was to instill the motivation that would enable its members as soldiers, to fight faithfully for the Third Reich. There was more emphasis on physical and military training than on academic study. The Nationalsozialistischer Reichsbund für Leibesübungen (NSRBL), the umbrella organization promoting and coordinating sport activities in Germany during the Nazi era, had the responsibility of overseeing the physical fitness development programs provided to the German youth. Members wore uniforms very like those of the SA, with similar ranks and insignia. The Hitler Youth also maintained several corps designed to develop future officers for the Wehrmacht (Armed forces). The corps offered specialist pre-training for each of the specific arms for which the member was ultimately destined. The Marine Hitler Youth, for example, was the largest such corps and served as a water rescue auxiliary to the Kriegsmarine. 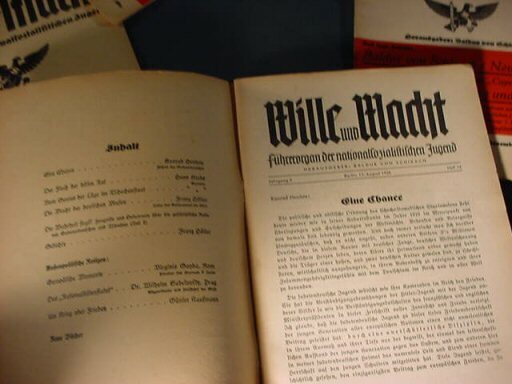 The Hitler Youth regularly issued the Wille und Macht (Will and Power) monthly magazine. This publication was also its official organ and its editor was Baldur von Schirach. 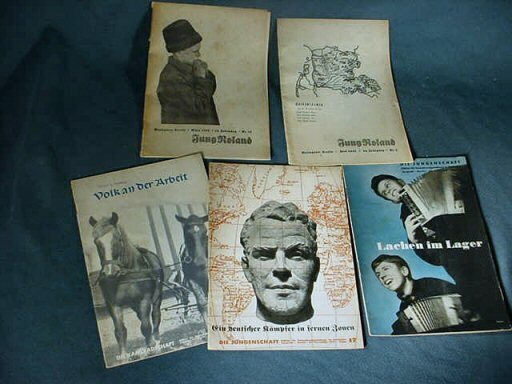 Other publications included Die Kameradschaft (Comradeship), which had a girl’s version for the BDM called Mädelschaft, and a yearbook called Jungen eure Welt (Youth your World). The basic unit of the Hitler Youth was the Bann (unit of the whole district, consisting of 2,400 to 3,600 members, with 4 Stamm/Stämmen each of 600 members or more), the equivalent of a military regiment. Of these Banne, there were more than 300 spread throughout Germany, each of a strength of about 6,000 youths. 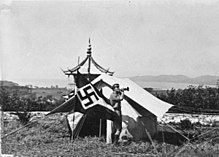 Each unit carried a flag of almost identical design, but the individual Bann was identified by its number, displayed in black on a yellow scroll above the eagle’s head. The flags measured 200 by 145 centimetres (79 in × 57 in). The displayed eagle in the center was adopted from the former Imperial State of Prussia. In its talons it grasped a white coloured sword and a black hammer. These symbols were used on the first official flags presented to the delegation of the Hitler Youth at a national rally of the NSDAP in August 1929 in Nürnberg. The sword was said to represent nationalism, whereas the hammer was a symbol of socialism. The poles used with these flags were of bamboo topped by a white metal ball and spear point finial. The Deutsches Jungvolk was the junior branch of the Hitler Youth, for boys aged 10 to 14. Its flag (Jungbann) generally followed the same style as those of the Hitler Youth. The differences were its flag had an all-black field with a white eagle; the scroll above the eagle’s head was in white with the unit number in black; and the sword, hammer, beak, talons, and left leg of the eagle were in silver-grey colour. The flags eventually measured 165 by 120 centimetres (65 in × 47 in) high. The flagpoles were of black polished wood topped with a white-metal spearhead-shaped finial. It displayed on both sides an eagle bearing on its breast the Hitler Youth diamond. “Leistungsbuch” (Performance booklet) of a Hitler Youth / Deutsches Jungvolk member. The symbol in the upper right, based on the Sowilo rune, reads “For accomplishments in the DJ (Deutsches Jungvolk)”. The symbol in the lower left, based on the Tiwaz rune, reads “For accomplishments in the HJ (Hitler Jugend)”. By December 1936, Hitler Youth membership had reached over five million. That same month, membership became mandatory for Aryans, under the Gesetz über die Hitlerjugend law. By 1938, the Hitler Youth had over 7.7 million members. This legal obligation was reaffirmed in March 1939 with the Jugenddienstpflicht, which conscripted all German youths into the Hitler Youth—even if the parents objected. Those parents who refused to allow their children to join were told that the state would take their children away. Massaquoi claims, though, that the war did not allow the law to go very far. From then on, most of Germany’s teenagers belonged to the Hitler Youth. By 1940, it had eight million members. Later war figures are difficult to calculate, since massive conscription efforts and a general call-up of boys as young as 10 years old meant that virtually every young male in Germany was, in some way, connected to the Hitler Youth. Only about 10 to 20% avoided joining. There were a few members of the Hitler Youth who privately disagreed with Nazi ideologies. For instance, Hans Scholl, the brother of Sophie Scholl and one of the leading figures of the anti-Nazi resistance movement White Rose (Weiße Rose), was also a member of the Hitler Youth. This fact is emphasised in the film The White Rose which depicts how Scholl was able to resist Nazi Germany’s ideology while being a member of the Nazi party’s youth movement. The 1993 Thomas Carter film Swing Kids also focuses on this topic. As German casualties escalated with the combination of Operation Bagration and the Lvov-Sandomierz Operation in the east, and Operation Cobra in the west, members of the Hitlerjugend were recruited at ever younger ages. By 1945, the Volkssturm was commonly drafting 12-year-old Hitler Youth members into its ranks. During the Battle of Berlin, Axmann’s Hitler Youth formed a major part of the last line of German defense, and were reportedly among the fiercest fighters. Although the city commander, General Helmuth Weidling, ordered Axmann to disband the Hitler Youth combat formations, in the confusion this order was never carried out. The remnants of the youth brigade took heavy casualties from the advancing Russian forces; only two survived. The Hitler Youth was disbanded by Allied authorities as part of the denazification process. Some Hitler Youth members were suspected of war crimes but, as they were children, no serious efforts were made to prosecute these claims. While the Hitler Youth was never declared a criminal organization, its adult leadership was considered tainted for corrupting the minds of young Germans. Many adult leaders of the Hitler Youth were put on trial by Allied authorities, and Baldur von Schirach was sentenced to 20 years in prison. However, he was convicted of crimes against humanity for his actions as Gauleiter of Vienna, not his leadership of the Hitler Youth, as Artur Axmann had been as the functioning leader of the Hitler Youth from 1940 onward – Axmann only received a 39 month prison sentence in May 1949, but was not found guilty of war crimes. Despite this, several notable figures have been “exposed” by the media as former members. These include Stuttgart mayor Manfred Rommel (son of the famous general Erwin Rommel); former foreign minister of Germany Hans-Dietrich Genscher; Pope Benedict XVI; philosopher Jürgen Habermas and the late Prince Consort of the Netherlands Claus von Amsberg. ^ “First NSDAP-related organization of German youth.” feldgrau.com. Retrieved: 1 February 2010. ^ Ernst Klee, Das Personenlexikon zum Dritten Reich. Wer war was vor und nach 1945, Fischer Taschenbuch Verlag, Zweite aktualisierte Auflage, Frankfurt am Main 2005, ISBN 978-3-596-16048-8, p. 694. ^ “Hitlerjugend: An In-Depth History.” axishistory.com. Retrieved: 1 February 2010. ^ Richard Bonney (15 June 2009). Confronting the Nazi War on Christianity: The Kulturkampf Newsletters, 1936–1939. Peter Lang. pp. 139–. ISBN 978-3-03911-904-2. Retrieved 5 March 2013. ^ H. W. Koch (8 August 2000). The Hitler Youth: Origins and Development 1922–1945. Cooper Square Press. pp. 220–. ISBN 978-1-4616-6105-4. Retrieved 5 March 2013. ^ “Wille und Macht.” germaniainternational.com. Retrieved: 1 February 2010. ^ “Other HJ publications.” germaniainternational.com. Retrieved: 1 February 2010. ^ “New Pope Defied Nazis As Teen During WWII.” The New York Times. Retrieved: 1 February 2010. ^ Hamilton, Charles (1984). Leaders & Personalities of the Third Reich, Vol. 1. San Jose, CA: R. James Bender Publishing. p. 248. ISBN 0-912138-27-0. Butler, Rupert. Hitler’s Young Tigers: The Chilling True Story of the Hitler Youth. London: Arrow Books, 1986. ISBN 0-09-942450-9. The League of German Girls or (cognate) Band of German Maidens (German: Bund Deutscher Mädel, BDM) was the girls’ wing of the Nazi Party youth movement, the Hitler Youth. It was the only female youth organization in Nazi Germany. At first, the League consisted of two sections: the Jungmädel, or Young Girls’ League, for girls ages 10 to 14, and the League proper for girls ages 14 to 18. In 1938, a third section was introduced, the Faith and Beauty Society (BDM-Werk Glaube und Schönheit), which was voluntary and open to girls between the ages of 17 and 21. With the surrender of Nazi Germany in 1945, the organization de facto ceased to exist. On 10 October 1945, it was outlawed by the Allied Control Council along with other Nazi Party organizations. Under Section 86 of the German Criminal Code, the Hitler Youth is an “unconstitutional organisation” and the distribution or public use its symbols, except for educational or research purposes, are not permitted. The Bund Deutscher Mädel had its origins as early as the 1920s, in the first Mädchenschaften or Mädchengruppen, also known as Schwesternschaften der Hitler-Jugend (Sisterhood of the Hitler Youth). In 1930 it was founded as the female branch of the Hitler Youth movement. Its full title was Bund Deutscher Mädel in der Hitler-Jugend (League of German Girls in the Hitler Youth). In the final electioneering campaigns of 1932, Hitler inaugurated it with a mass meeting featuring the League; on election eve, the League and Hitler Youth staged “evening of entertainment.” It did not attract a mass following until the Nazis came to power in January 1933. Soon after taking office as ‘Reichsjugendführer‘ on 17 June 1933, Baldur von Schirach issued regulations that suspended or forbid existing youth organizations (‘concurrence’). Those youth groups were compulsorily integrated into the BDM, which was declared to be the only legally permitted organization for girls in Germany. Many of the existing organizations closed down to avoid this. These Nazi activities were a part of the Gleichschaltung starting in 1933. The Reichskonkordat between the Catholic Church and Nazi Germany, signed on July 20, 1933, gave a certain shelter to the Catholic youth ministry, but they were the object of much bullying. The “Gesetz über die Hitlerjugend” (law concerning the Hitler Youth) dated 1 December 1936, forced all eligible juveniles to be a member of HJ or BDM. They had to be ethnic Germans, German citizens and free of hereditary diseases. Girls had to be 10 years of age to enter this League. The BDM was run directly by Schirach until 1934, when Trude Mohr, a former postal worker, was appointed to the position of BDM-Reichsreferentin, or National Speaker of the BDM, reporting directly to Schirach. After Mohr married in 1937, she was required to resign her position (the BDM required members to be unmarried and without children in order to remain in leadership positions), and was succeeded by Dr. Jutta Rüdiger, a doctor of psychology from Düsseldorf, who was a more assertive leader than Mohr but nevertheless a close ally of Schirach, and also of his successor from 1940 as HJ leader, Artur Axmann. She joined Schirach in resisting efforts by the head of the NS-Frauenschaft (Nazi Woman’s League), Gertrud Scholtz-Klink, to gain control of the BDM. Rüdiger led the BDM until its dissolution in 1945. As in the HJ, separate sections of the BDM existed, according to the age of participants. Girls between the ages of 10 and 14 years old were members of the Young Girl’s League (Jungmädelbund, JM), and girls between the ages of 14 and 18 were members of the Bund Deutscher Mädel (BDM) proper. In 1938, a third section was added, known as Faith and Beauty (Glaube und Schönheit), which was voluntary and open to girls between 17 and 21 and was intended to groom them for marriage, domestic life, and future career goals. Ideally, girls were to be married and have children once they were of age, but importance was also placed on job training and education. At the beginning of World War II, the Reichsarbeitsdienst became compulsory also for young women. It lasted half a year. Many young women became ‘Blitzmädel’ (Wehrmachthelferin or female combat soldiers) during World War II. While these ages are general guidelines, there were exceptions for members holding higher (salaried) leadership positions, starting at the organizational level of “Untergau”. As regards lower (honorary) positions, even members of the JM could apply for them after two years of membership and would then obtain such a position typically at the age of 13. The higher leadership, however, was recruited from members over 18 and was expected to maintain salaried office for no more than 10 years, and to leave the BDM at the age of 30 by the latest. As a general rule, members had to leave when they married and especially when they had children. The BDM uniform was a full blue skirt, middy blouse and heavy marching shoes. Jutta Rüdiger (1910 – 2001) was a special case. She joined the BDM only in 1933, at the age of 23 and after having finished her doctorate in psychology. She obtained honorary positions instantly in 1933 and early 1934, was promoted to her first salaried position (leader of Untergau Ruhr-Lower Rhine) in June 1935 and was appointed Reichsreferentin for the BDM (head of the BDM) in November 1937 (aged 27), succeeding Trude Mohr, who had vacated the position on her marriage, as Nazi policy required. She kept this position even until the German defeat, when she had reached the age of 34. Clementine zu Castell-Rüdenhausen (b. 1912), a countess and member of the higher Franconian aristocracy, was appointed leader of Gau Unterfranken in 1933, at the age of 21, which also seems to have been the age when she joined the BDM, as no earlier date of membership nor any previous lower positions are recorded in her case. She was appointed head of “Faith and Beauty” in January 1938, a few days before her 26th birthday, and was discharged in September 1939 because of her marriage with Wilhelm “Utz” Utermann in October 1939. She was followed by an Austrian member, Annemarie Kaspar (b. 1917), who had been appointed Untergauführerin at the age of 20 in March 1938 and became head of B&B two weeks before her 22nd birthday. She too married and was discharged in May 1941, to be replaced in June 1941 by Martha Middendorf (b. 1914), who was 27 at the time of her appointment and was discharged already in February 1942, as she too had married. From this time on, Jutta Rüdiger, who was no candidate for marriage but living in lifelong partnership with her comrade Hedy Böhmer, took over to lead the B&B directly, thus holding both leadership positions until 1945. The BDM used campfire romanticism, summer camps, folklorism, tradition, and sports to indoctrinate girls within the National Socialist belief system, and to train them for their roles in German society: wife, mother, and homemaker. Their Home Evenings revolved around domestic training, but Saturdays involved strenuous outdoor exercise and physical training. The purpose of these activities was to promote good health, which would enable them to serve their people and their country. The “home evenings”—ideally to be conducted in specially built homes—also included world view training, with instruction in history. This instruction would include learning the Horst Wessel song, the Nazi holidays, stories about Hitler Youth martyrs, and facts about their locality and Germans culture and history. Physical education included track and field sports like running and the long jump, gymnastics (e.g. somersaulting and tightrope walking), route-marching, and swimming. The importance of self-sacrifice for Germany was heavily emphasized; a Jewish woman, reflecting on her longing to join the League of German Girls, concluded that it had been the admonishment for self-sacrifice that had drawn her most. The League was particularly regarded as instructing girls to avoid Rassenschande or racial defilement, which was treated with particular importance for young females. Ilsa McKee noted that the lectures of Hitler Youth and the BDM on the need to produce more children produced several illegitimate children, which neither the mothers nor the possible fathers regarded as problematic. These and other behaviors taught led parents to complain that their authority was being undermined. In 1944, a group of parents complained to the court that the leaders of the League were openly telling their daughters to have illegitimate children. Public opinion attributed a great deal of sexual laxity to the members. The preparation camps for the Landdienst of girls and boys often lay nearby. 900 of the girls participating in the 1936 Reichsparteitag in Nürnberg came back pregnant. In 1937, a prohibition came out saying that camping was forbidden to the BDM. Jungmadel were only taught, the BDM was involved in community service, political activities and other activities being considered as useful at that time. Before entering any occupation or advanced studies, the girls, like the boys in Hitler Youth, had to complete a year of land service (“Landfrauenjahr”). Although working on a farm was not the only approved form of service, it was a common one; the aim was to bring young people back from the cities, in the hope that they would then stay “on the land” in service of Nazi blood and soil beliefs. Another form of service was as a domestic work in a family with many children. The ‘Faith and Beauty’ organizations offered groups where girls could receive further education and training in fields that interested them. Some of the works groups that were available were arts and sculpture, clothing design and sewing, general home economics, and music. The older girls volunteered as nurses’ aides at hospitals, or to help at train stations where wounded soldiers or refugees needed a hand. After 1943, as Allied air attacks on German cities increased, many BDM girls went into paramilitary and military services (“Wehrmachtshelferin“), where they served as Flak Helpers, signals auxiliaries, searchlight operators, and office staff. Unlike male HJs, BDM girls took little part in the actual fighting or operation of weaponry, although some Flak Helferinnen operated anti-aircraft guns. Conversely, the young Polish girls who were selected for “racially valuable traits” and sent to Germany for Germanization were made to join the League as part of the Germanization. By 1944, the drafting of boys resulted in most of the “land service” help with the harvest was performed by girls. In the last days of the war, some BDM girls, just like some boys of the male Hitler Youth (although not nearly as many), joined with the Volkssturm (the last-ditch defense) in Berlin and other cities in fighting the invading Allied armies, especially the Russians. Officially, this was not sanctioned by the BDM’s leadership which opposed an armed use of its girls even though some BDM leaders had received training in the use of hand-held weapons (about 200 leaders went on a shooting course which was to be used for self-defense purposes). After the war, Dr. Jutta Rüdiger denied that she had approved BDM girls using weapons, and this appears to have been the truth. The ‘Kontrollratsgesetz Nr. 2’ (enacted 10 October 1945) by the Allied Control Council forbade the NSDAP and all its sub-organizations, including the BDM. Their properties were confiscated. ^ Gisela Miller-Kipp (ed. ), “Auch Du gehörst dem Führer”: die Geschichte des Bundes Deutscher Mädel (BDM) in Quellen und Dokumenten, Juventa publ., Weinheim et al. 2001, p. 56f. ^ For her and the following see Miller-Kipp (2001), pp. 41 ff. ^ Richard C. Lukas, Did the Children Cry? Hitler’s War against Jewish and Polish Children, 1939-1945. Hippocrene Books, New York, 2001. ← The SA – aka Hitler’s “Brownshirts”, who were they and what happened to them?